Clearly Centsless..who wants my 2 cents anyway? 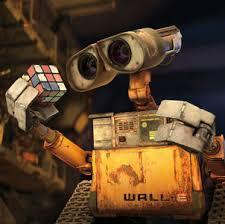 : (Wall E) Yes kids the end is near! (Wall E) Yes kids the end is near! The end of the movie was the funniest and MOST disturbing part of the film. After 700 years in space, hundreds of clinically obese people floating around in their lounge chairs (they are too fat to walk) on board the space craft Axiom, are jarred out of their special seats and slide/roll across the lido deck into a heap. It was the most pathetic/disturbing albeit funny thing I'd seen in a while. In my opinion the message of the movie was clear. The world is going to Hell in a hand basket! Both girls left the theater saying "That's going to happen eventually isn't it?" I was looking for a movie to entertain, not scare my kids. Having said that, both kids and I did enjoy the movie. And you have to appreciate PIXAR's computer animation. It was a fantastic piece of work.